One of our new patient’s named Tressa, gave us this wonderful review after being very happy with the care she received from Voyles Family Dental. The two days before she was seen, Tressa was having unbearable tooth pain. Her regular dentist was not able to do an extensive root canal surgery, so she was recommended to Voyles Family Dental by a friend. 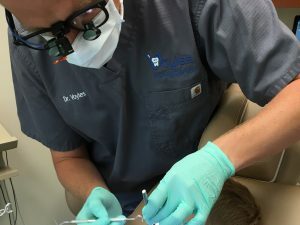 Tressa went into Voyles Family Dental and Dr. Voyles explained step by step what needed to happen in order to relieve her pain. The staff worked her into their schedule and stayed late to make sure she could leave pain free.